Perseus is one of the greatest heroes spoken of in Greek mythology, for Perseus was the famed vanquisher of the Gorgon Medusa. The adventures of Perseus have been told, and retold, over the millennia, and even today his story regularly appears on the big screen. ​The story of Perseus begins in the Greek kingdom of Argos, at a time when King Acrisius was on the throne; although he had lost half his kingdom to his brother Proetus, who now had a kingdom based around Tiryns. Acrisius was married to Eurydice, daughter of King Lacedaemon, and Eurydice would bear to Acrisius but one child, a daughter who was named Danae. Acrisius would long for additionally children though, for he wanted a male heir, to succeed him as king of Argos. ​As time passed, and Eurydice bore no more offspring, Acrisius would visit the Oracle of Delphi to ask whether a male heir would be forthcoming. As was the way though, the words uttered to Acrisius gave the king no comfort, for whilst a male heir would come it was to be a grandson, rather than a son, and that grandson was destined to kill King Acrisius. Returning to Argos, Acrisius was now far more concerned about the longevity of his life than having a male heir. At this point in time, Acrisius had no grandson, and so if he had no more children, and his daughter Danae had no children, then there would be future grandson to cause his demise. Acrisius thus decided to prevent Danae from having any children, by stopping any potential male suitor from having access to his daughter; to this end Acrisius constructed a bronze tower, with only one guarded entrance, and smooth bronze walls that could not be climbed. ​The construction of the bronze tower, and the confinement of Danae within, only aroused the interest of Zeus, and when the supreme god was told of the beauty of Danae, Zeus decided to descend from Mount Olympus to investigate. Acrisius had constructed the bronze tower to ensure no mortal suitor could gain access but this not dissuade Zeus in the slightest, for Zeus transformed himself into a shower of gold, allowing the god to cascade through the roof of the bronze tower, and to fall into the lap of Danae. ​This meeting of Danae and Zeus ensured that Danae fell pregnant, and after the allotted time Danae gave birth to a son, whom she named Perseus. ​Acrisius of course could not fail to notice that Danae had given birth to a grandson for the king, and Acrisius also recognised that only a god could have made his daughter pregnant; despite the assertions by some that it was actually Acrisius’ brother Proetus who had made Danae pregnant. Acrisius now faced a dilemma, for he could not kill his grandson, for this was sure to anger a powerful god, but if he allowed Perseus to grow up, then surely he was destined to die at the hands of his grandson. Acrisius then decided he had but one option, and he placed Danae and Perseus into a large wooden chest, and then cast that chest adrift upon the open sea. Acrisius reasoned that if they chest floundered and his daughter and grandson died, then it must have been the will of the gods to let them die, and if the chest did not flounder, then it would drift a great distance away, ensuring that Perseus was no future threat to him. 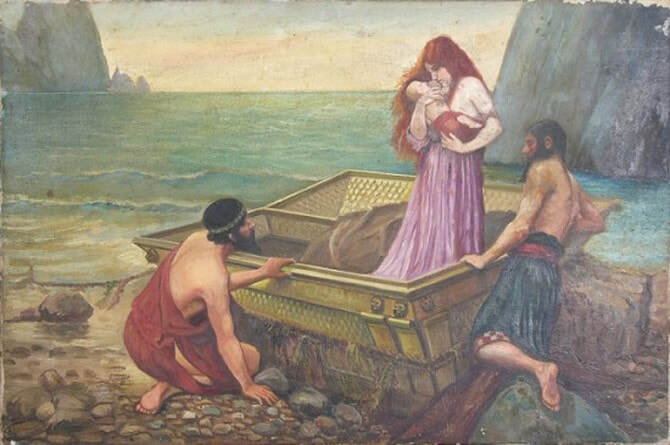 The chest of course did not flounder, for Zeus looked down upon his lover and his son from Mount Olympus, and enlisting the help of Poseidon, ensured that the chest safely came to rest upon one of the beaches of the island of Seriphos. The chest, and its occupants, was found by a fisherman by the name of Dictys, and thereafter Danae and Perseus were introduced to King Polydectes of Seriphos, for Polydectes and Dictys were brothers. Some tell of Danae and Perseus living with Dictys, whilst others tell of them being guests of Polydectes, but in either case, as the years went by so Perseus grew into an athletic young man. As the years passed, the beauty of Danae did not diminish, and Polydectes sought to make Danae his new queen. Danae though was not in love with Polydectes, and the king found that he could not force himself upon Danae, for Perseus was now strong enough to protect his mother. Polydectes though, came up with a plan, which he felt could remove Perseus as an obstacle, and thus Polydectes told Perseus that he planned to marry a woman named Hippodameia, but could not do so until he possessed a suitable wedding gift, and the only suitable wedding gift was the head of the Gorgon Medusa. Polydectes had every reason to believe that the quest was impossible and deadly, for Medusa was a Gorgon, a monster with snakes for hair and a gaze that could make any living thing turn to stone. 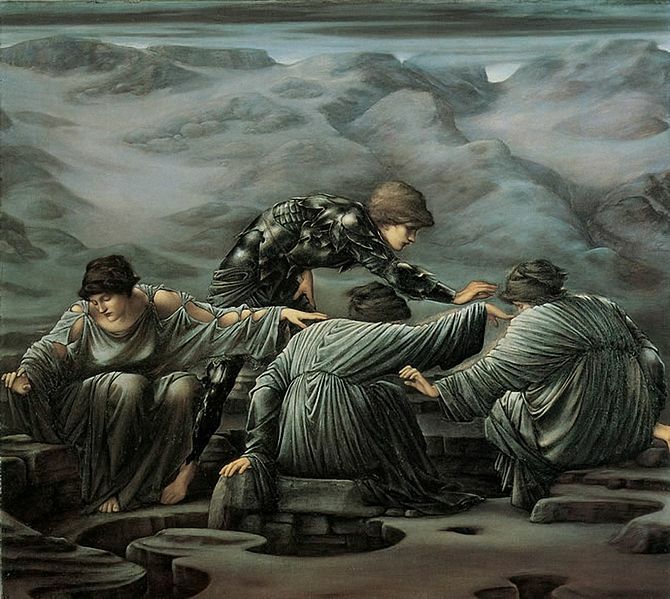 Having accepted the quest, Perseus immediately had problems to overcome, for no-one even knew where Medusa might be found. The gods of Mount Olympus were taking an interest in the quest of Perseus though, and Athena and Hermes came forth to help their half-brother. Perseus is taken to the Garden of the Hesperides by Athena and Perseus, and there the goddess gives to Perseus her own reflective shield, and a magical satchel in which the head of the Gorgon can be safely stored. Hermes then gives to Perseus his own winged sandals, as well as an adamantine sword. ​Additionally, Perseus is also given Hades’ helmet of invisibility, the helmet that had helped bring to an end the Titanomachy. ​Athena and Hermes could not give to Perseus the location of Medusa, but Perseus was told to seek out the holders of this secret, the Graeae. The Graeae, the Grey Sisters, were siblings of the Gorgons, for they too were daughters of Phorcys and Ceto. It was not just a question of asking the Graeae where their sister could be found though, and Perseus had to force the secret location from them. This, Perseus did by taking possession of the single eye that the three Graeae shared, effectively blinding them, and keeping it, until they revealed where Medusa could be found. Now with knowledge of where Medusa was to be found, Perseus made use of Hermes’ winged sandals to fly to the location of Medusa’s cave. Perseus entered the cave of Medusa quietly, for any noise might make all of the Gorgons aware of his presence, for the caves of Medusa’s sisters were also close by. Perseus approached Medusa, making use of Athena’s reflective shield to go towards the Gorgon, without being in danger of the stony gaze. Then, his hand guided by Athena, Perseus made use of the adamantine sword, to decapitate Medusa with one swing. Quickly, Perseus then picked up the head of Medusa, and placed it within the satchel given to him by Athena. 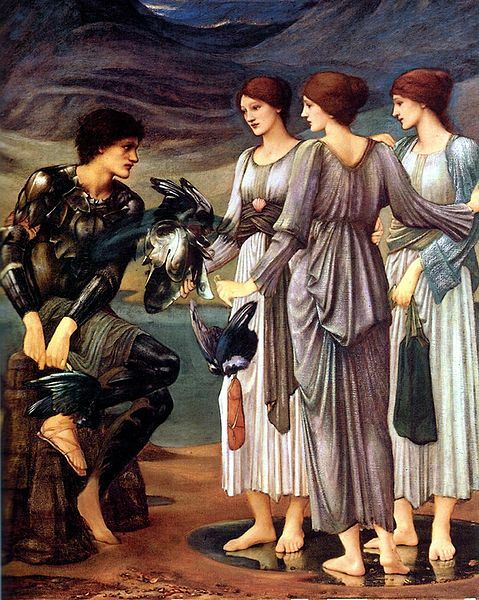 The noise of their sister’s demise awoke Euryale and Stheno, but the helmet of invisibility, and the winged sandals, ensured that Perseus managed to escape, without being harmed. Perseus now faced a long journey home, and it proved to be one with its own adventures. Perseus would fly over Aethiopia, a land south of the Sahara, and a land being ravaged by a sea-monster, the Aethiopian Cetus. Aethiopia was, at the time, ruled by King Cepheus, and the hubris of his wife, Cassiopeia, in describing herself as even more beautiful than the daughters of Nereus. This statement, from a mere mortal, outraged the Nereids, who complained to Poseidon, who, to placate the Nereids, sent the sea-monster. Cepheus would seek a solution to his problem, but when the king was informed that only the sacrifice of his own daughter Andromeda would placate the monster, Cepheus was forced to do the unthinkable. Thus it was, that as Perseus flew over Aethiopia, he observed Andromeda chained to a sea rock, and the approach of the Aethipoian Cetus. Perseus would rescue the damsel in distress, for the Geek hero took out the head of Medusa from the satchel, and the power of the Gorgon’s gaze was such, that the Aethipoian Cetus was transformed to stone, despite Medusa being dead. Cepheus then arranged for Andromeda and Perseus to wed, but Andromeda had already been promised to Phineus, son of Belus, and so at the wedding feast, Phineus and his followers tried to prevent the marriage going ahead. Perseus would have been killed, but once again, the son of Danae removed Medusa’s head from its satchel, and Phineus and his followers were turned to stone. Perseus and Andromeda then leave Aethiopia and head for Seriphos. Perseus, or the head of Medusa, can also be credited with creating the coral of the Red Sea, as well as the poisonous snakes of the Sahara, for both were said to have been created by the blood of Medusa, as it seeped from the magical satchel. Perseus eventually arrives back in Seriphos, but his return is unexpected, for in his absence, Polydectes has taken the opportunity to arrange his marriage to Danae. ​When Perseus learns of his mother’s abuse, he enters Polydectes’ palace, and making use of the head of the Gorgon Medusa, turns Polydectes and all of his retinue into stone. It was subsequently said by the inhabitants of Seriphos that the stone boulders found on the island were the eroded figures of Polydectes and his men. With his quest at an end, Perseus returned the gifts given to him by the gods back to his benefactors. Athena would make special use of the head of Medusa though, for she would incorporate it into her aegis, her shield, making it a powerful weapon, as well as a means of defence. Perseus would subsequently install Dictys as the new king of Seriphos, with Perseus, Andromeda and Danae then departing from the island, returning to the Argolis. The distance that Acrisius had sought to put between him and his grandson was now greatly diminished. As to whether the prophecy of Perseus killing Acrisius came true, depends upon the version of the Perseus myth being read. One version tells of the Perseus competing in athletic games at Larissa in Thessaly, where the hero was exhibiting the new game of quoits that he had invented. 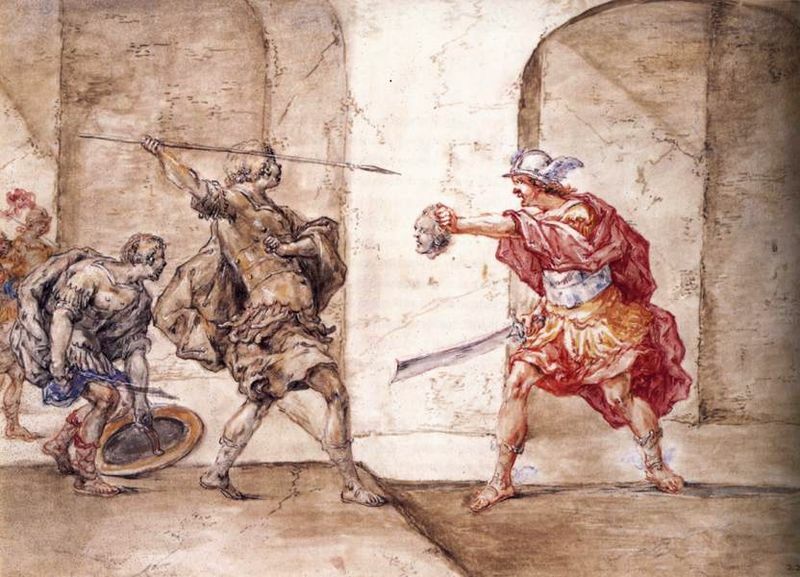 As Perseus threw a quoit, Acrisius was said to have walked in front of Perseus, and was struck by the quoit, and the king of Argos was thus killed. A similar story tells of Perseus and Acrisius both being present in Larissa to attend the funeral of King Amyntor, and then in the funeral games, Acrisius was struck by a discus thrown by his grandson. A third, less common version tells of Perseus not actually killing Acrisius, for when Perseus returned to the Argolis, he found that his grandfather’s kingdom had been seized by Proetus. Perseus would therefore kill Acrisius’ brother Proetus, and restore his grandfather to the throne. It is more common to read of Perseus killing Acrisius, but Perseus would then refuse to succeed his grandfather as King of Argos. Even though Acrisius death was an accident, Perseus believed that it was not right to benefit from his death. Instead, Perseus arranged an exchange of kingdoms, and Perseus would give the throne of Argos to Megapenthes, the son of Proetus, whilst he succeeded Megapenthes as the king of Tiryns and Midea. Megapenthes would seemingly have got the better part of this exchange, for Argos was the greater kingdom, but Perseus would work hard to develop his new kingdom. To this end Perseus would build a new city at a spot where he dropped his cap, this new city would become known as Mycenae; and under the guidance of Perseus, Mycenae became one of the most powerful cities of the age. ​Perseus would make Mycenae his capital city, and home to him and Andromeda. Andromeda would give birth to nine children, seven sons and two daughters for Perseus. The sons of Perseus were, Perses, the ancestor of all Persian kings; Electryon, Perseus’ heir, and also grandfather of Heracles; Alcaeus; Heleus; Mestor; Sthenelus; and Cynurus. The daughters were Autochthe, future wife of Aegeus, and Gorgophone, future queen of Sparta. ​There is only one obscure myth about the death of Perseus, for in Fabulae it was said that Megapenthes killed Perseus, in revenge for the death of his father, but in most sources it was said that Perseus became one of the rarest figures in Greek mythology, a hero who got to live out his life happily. 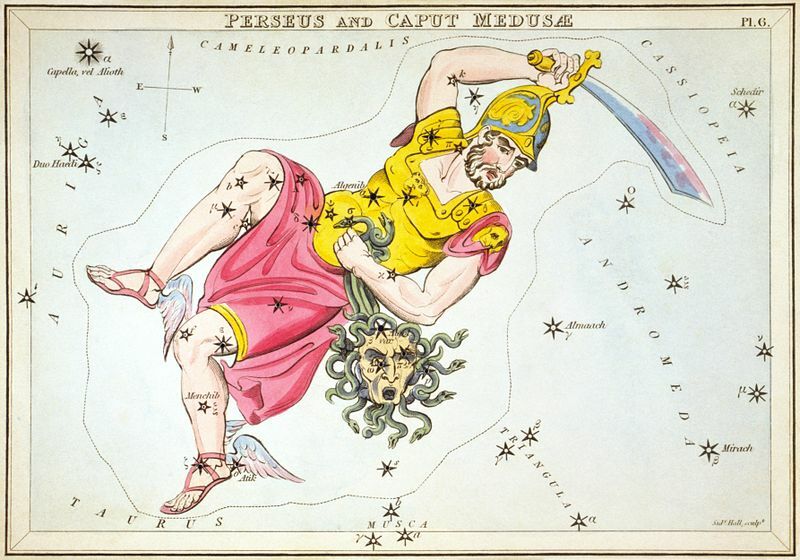 The likeness of Perseus would be placed amongst the stars as the constellation Perseus, in remembrance of his adventures, just as many other figures from Perseus’ quest were also depicted in the heavens. 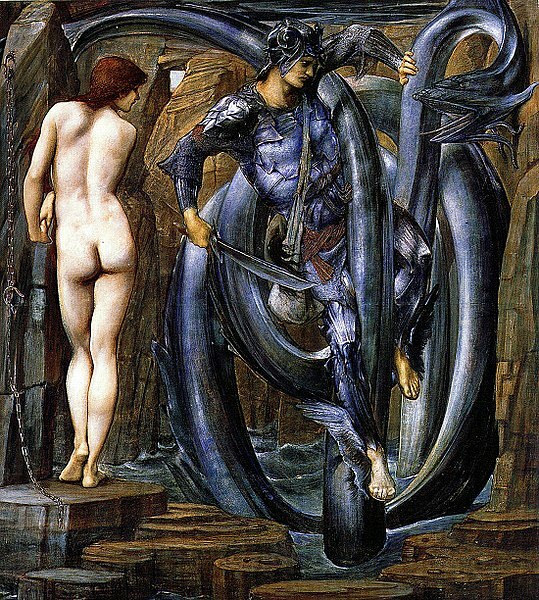 Many alternations and amendments have been made to the Perseus myth over the millennia, and many of the most common alterations appear in art work. It has become common to paint Perseus upon the back of Pegasus, the mythical winged horse, flying to the rescue of Andromeda, instead of making use of Hermes’ winged sandals. Pegasus was the son of Medusa, emerging from the severed neck of the Gorgon, but in classical texts, Perseus never made use of the horse, for it was Bellerophon who utilised the mythical animal in his own adventures. It has also become common to suggest that Perseus turned the Titan Atlas to stone with the head of Medusa. Atlas though was still very much alive, and non-petrified, when he was encountered by Heracles, the great-grandson of Perseus.